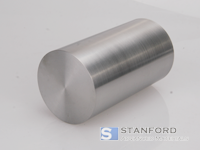 Stanford Advanced Materials (SAM) has been providing high quality zirconium rods to meet clients’ needs for over 20 years. We provide high quality pure Zirconium and Zirconium alloy rods with competitive prices and unrivaled customer service. A zirconium (Zr) rod is ideal for use in a nuclear power rod because of its small neutron adsorption cross-section and high melting point of 1855°C (3371°F). This silvery metallic element also leads to better wear resistance and hardness of commercial amorphous metals, more commonly known as metallic glass. Due to high corrosion resistance, zirconium products, such as these rods, have many uses in medical equipment and to handle other highly corrosive chemicals. Zirconium rods also act as raw materials for other zirconium products, like crucibles and reactors, and can be consumed in zirconium electrodes. Multiple sizes are available for zirconium rods and we do make customized products. Our zirconium rods are carefully handled to minimize damage during storage and transportation and to preserve the quality of our products in their original condition.